Add some shine to your daughter's Sweet 16 party with these gorgeous one-of-a-kind candles designed just for her. Each 2.5" tall frosted glass holder has a poured wax candle. You can choose from over 50 different designs and many ink colors to make the candles match the color and theme of the party. We'll add her name and birth date to make an extra special keepsake for your guests. I'm trying to place correct order with personalization. Will I be able to view them before they are made? 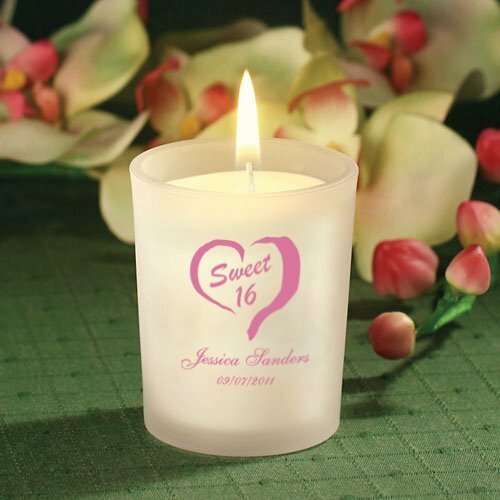 There's a personalization button in the shopping cart which allows you to see a preview of the Custom Sweet 16 Frosted Glass Candle Favor. It may not auto-fill, but you can still make your selections in the personalization section of the cart. There's also a View Glass Designer link that you can click on in the product description to see your preview.